Lowbrook Cottage01263 715779work01603 870304fax Self-cateringSituated in the quiet village of Dickleburgh, this property sits next to the owner's home. Providing large and comfortable rooms, this cottage is surrounded by stillness and has great access to many pursuits of the surrounding area, including walks, cycle routes and nature reserves. Guests can enjoy its private courtyard and use of the owner's garden. 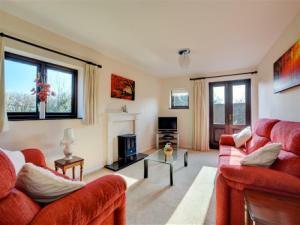 Sitting room with patio doors leading outside. Situated in the quiet village of Dickleburgh, this property sits next to the owner's home. Providing large and comfortable rooms, this cottage is surrounded by stillness and has great access to many pursuits of the surrounding area, including walks, cycle routes and nature reserves. Guests can enjoy its private courtyard and use of the owner's garden.